cdiffell 2 So far so good. This is a great light game ala Pulling Strings - non-threatening and yet with enough strategy to keep it interesting. No surprise it's from Reiner Knizia. nih 2 Interesting variation on Connect 4 - the idea of shifting the pieces down when a column is full adds a few tactical nuances! Cerulean 1 Nice variation on Connect Four. neilb 1 Surprisingly tricky for such a "small" game (small playing area, simple rules). I like it! 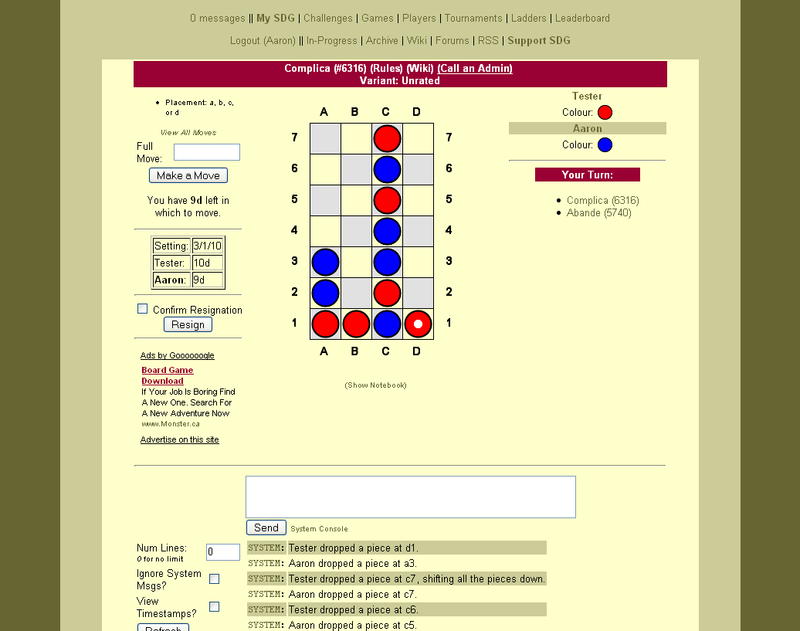 nycavri 1 Surprisingly effective as a tournament game, minimizing the first player advantage. Aaron 0 Need to play more. So far, it's an interesting Connect-4 variant. Zotmeister 0 For those who think Connect 4 is too short, I guess. Draw5PlayAll -1 ...cannot grasp the strategy even after more than 5 games. 173-130 in favor of player one. 10 moves average. Sigh.